Enable your girls to break out into a healthy sweat in style with our expansive range of sports bras for girls designed from a variety of soft, stretchy fabrics like cotton and lycra blends that offers superior comfort and breathability. Available in fun patterns and bold colours, she can dial down or dial her attitude up a notch - they are tailored to fit a range of body types properly, regardless of the intensity of the activity. Our selection of kids’ sports bras are specially designed with moisture-wicking fabric technologies that pulls sweat away from the skin keeping the skin dry. Lightweight ventilated panelling helps keep the kids cool while the flat seaming reduces chaffing, enabling unrestricted movement during warm up or cool down. Being an essential wardrobe addition, sports bras for girls are a much-needed item of clothing for your kids’ changing body needs. 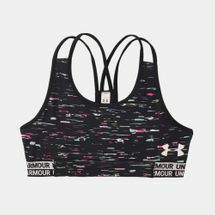 Whether she is running laps on the court, shooting hoops or just lounging in her favourite top, our selection of sports bras will enable them to feel comfortable and well fitted like push up bras. Browse through the latest range of sports bras for girls and shop by sport or style, online with us today. Come and check out our wide range of kids’ sports bras and shop online at Sun and Sand Sports, from the comfort of your natural environments, and get your order delivered straight to your doorstep in Riyadh, Jeddah and the rest of Saudi Arabia, KSA.